The Youth Power Story Series highlights the accomplishments of CFJ and leaders of color from all over California. 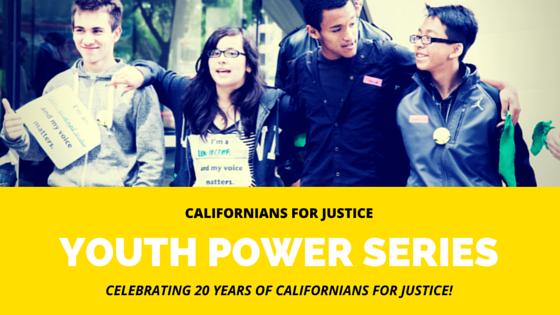 Join us in celebrating youth power in honor of Californians for Justice’s 20th Anniversary! Good leaders don’t set out to lead, they set out to make a difference. 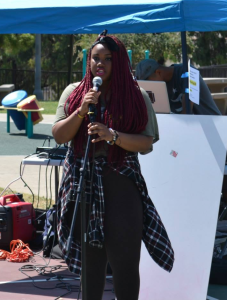 Karionne Stokes is a junior in Long Beach, CA and is a CFJ youth leader. In just 2 years with CFJ Karionne has grown quickly, fostering a passion for social justice that has sparked that same excitement in her peers. She is just one of many young women of color who have joined CFJ to build their skills and experience, and in the process have found their voice, taking it upon themselves to nurture and lift up other young women of color who want to speak up about the issues affecting them. Karionne initially joined CFJ just to develop her leadership skills and to make new friends who were involved in making a difference at her school. She quickly moved through workshops and trainings, eager to learn more, and to gain the confidence and skills to speak up about the issues that affect her and other women of color at her school. After several months of building her leadership among her peers, and her public speaking skills, Karionne had the opportunity to speak at the Long Beach Unified School District Board Meeting. Inspired by her experience, Karionne applied to CFJ’s Summer Youth Leadership Academy. During this intensive 5-week leadership development camp, she really found her voice, and was moved to take on a leadership position in her school’s chapter. As a young black woman in a school system that so often ignores the voices of Karionne and her peers, she is passionate about sharing her story with other young women of color to create a school and district where the voices of young people like her are really valued. This year, Karionne is using her passion and skills in partnership with other CFJ youth leaders to lead an anti-bullying initiative at her school. They’ve already conducted a comprehensive survey on the issue, and are planning a school-wide assembly to address the issue and make their school a safer place for youth of color. Karionne is just one of many students with stories just like this. In celebration of our 20th anniversary, we will continue to share the stories of CFJ youth leaders past and present who exemplify the leadership and passion all students can achieve! Thank you Karionne for your leadership!